If you never negotiate your starting salary or your freelance rate, you are potentially leaving a million dollars on the table throughout the course of your career. That's a lot of money to be missing out on just because you don't want to ask a question that makes you feel uncomfortable. But statistics show that women have trouble with this ask time and time again. One 2007 study published in the Journal of Personality and Social Psychology found that 50 percent of men will negotiate their salary compared to just 12 percent of women. Not to mention, women on average are already only getting paid $0.79 on the dollar compared to men, and that doesn’t account for race and ethnicity or parental status. When it comes to gender parity, this needs to be tackled from all angles, including making legislative changes, company changes and more transparency and addressing motherhood through things like access to affordable childcare, better family leave policies and improved health care for women and more. So, as individuals, we are often left wondering what, if anything, we can do. The answer is quite simple: Advocate for yourself. Start closing the gap by negotiating your own salary or freelance rates to ensure you're standing up for what you are worth. Do your research. Whether you are negotiating in the interview process, asking for a raise internally or setting your freelance rate, you must first know the market. Consult sites like Fairygodboss — which has a salary database — to find out what people in similar roles are earning. The next step is to talk to people in your role or the role you want. 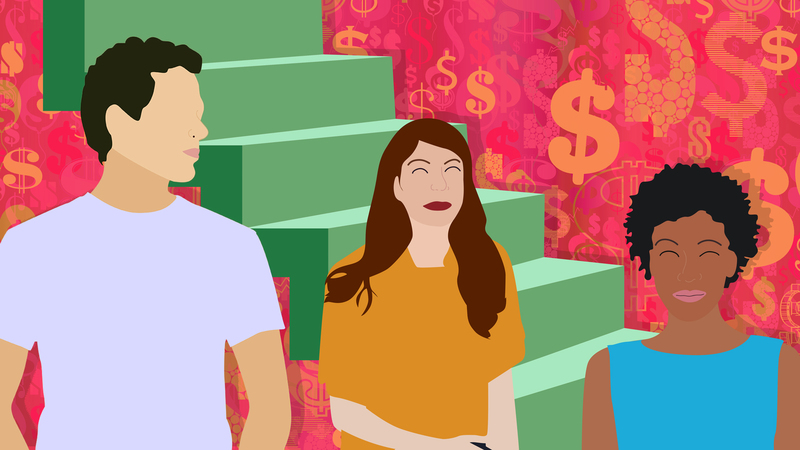 While talking about money is one of those taboo topics in the U.S., it’s actually surprising how many people are willing to have this conversation. So ask around, and make sure to ask both men and women so you have a good picture of salary ranges. Once you have the information, solidify your rate/salary range in your head. What do you want? What are you willing to take? At what rate do you just say no? Having these numbers clear in your mind will make the conversations easier. Most of my clients aren't comfortable negotiating their salaries. When I ask why they're hesitant, the responses that I hear are almost always influenced by fear, particularly from my female clients, who worry that the offer will be rescinded if they ask for more money — or that they'll seem ungrateful for requesting more. Here’s the thing: As long as you're coming back with an educated ask that's backed in market research of what the industry, role and years experience should pay, there's no reason that a company should rescind a job offer. Most companies expect you to negotiate, so they'll throw out a lower number in order to have the room to meet your ask. In fact, a female recruiter once told me that she always feels a twinge of guilt when her female candidates don’t try to negotiate, because there's nothing she can do to increase their base salary if they don't ask. In the rare event that a company does rescind the offer, take a minute to step back and ask yourself honestly: Do you really want to work for this company? That’s a huge red flag and paints a clear picture of the lack of value they have for their employees. Negotiating your salary doesn't make you seem ungrateful — it's not showing your enthusiasm that will make you seem unappreciative. When you're offered the role, reiterate your strong interest in the position and the company first — and then follow your genuine excitement with an ask about your salary. 3. Don't get caught off guard! Personally, I think it’s smart to do your research regarding the market on a regular basis. While most people are prepared to talk about money when bidding a project or interviewing for a new role, you may not expect it to be brought up during an initial phone screen, in a meeting with your boss or even during a seemingly innocuous networking conversation. If you are keeping up with your research, you likely have a good understanding of the market and acceptable ranges for your role or any target positions. But even the best-researched person can be thrown by the salary/rate history questions. While some states and cities (California, Oregon, Massachusetts, New York City and others) are banning questions about your previous salary history, clearly, the majority of the country still allows this type of question, or you may be faced with it even with the new laws in effect. So when you get asked about your salary/rate history, you’ll be ready. Politely decline to answer and instead say something similar to, “I’d prefer to focus on the range for this opportunity and whether or not this is a mutual fit. Are you able to provide the budget you have for this position/project?” Let them share this number first and then respond as to whether or not that aligns with your goals. For freelancers, not only can the initial negotiation be difficult, but you need to set clear boundaries to avoid scope creep. As expectations change, it is important for you to define anything outside your original contact and charge appropriately. If the fear creeps up and you are worried that you’ll lose the account, or miss out on an opportunity, I encourage you to take a step back, clearly define your bottom line (the number at which you’ll walk away) and write down all the reasons you deserve that rate or salary. Know your worth!